If you happen to be one of the estimated 50 million Americans who suffer from some form of allergies you need to learn to control the things that trigger a reaction. 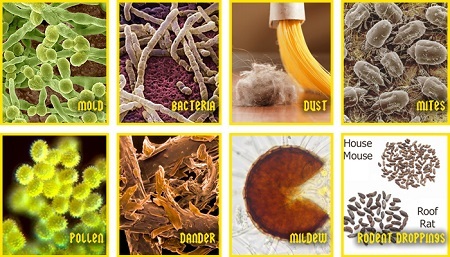 These are called allergens and they can be found in many places, but especially inside your home. One of the biggest offenders is dust mites which are tiny insects that live inside dust particles, typically deep inside the fibers of your carpet or bedding. You will want to reduce your exposure to them as much as possible as the Asthma and Allergy Foundation of America states that people with asthma or allergies can easily get their symptoms triggered by dust mites. Fortunately there are a lot of things that you can do to keep your home healthier and much more comfortable for you and your family members. The first line of defense is to clean the inside of your home thoroughly and often, at least once per week. Try to remove allergens from all the surfaces around the house. It is recommended to use a microfiber cloth as they can quickly attract fine dust that would otherwise just blow around. The difficulty in cleaning dust is that it can easily be stirred up into the air, allowing the particles to travel around and land on just about everything in sight. Microfiber or other specialty dusting cloths are designed to work like a magnet to attract these tiny allergens before they can take flight. It’s little surprise to anyone that carpeting, especially thick or high pile is a haven for dust mites. If possible replace these flooring options with smoother ones like hardwood, tile, and laminate which provide almost no place for dirt to hide. You can use smaller area rugs for some coverage as these are easily cleaned and can even be taken outdoors to be shaken out. Should you have carpets make sure you vacuum them often with a model outfitted with HEPA filtration. These specialty filters are rated to trap the smallest of allergens inside as the air passes through, so the air that comes out is much cleaner. It’s important to buy one of the best vacuum brands like Miele or SEBO as they are built to very high standards. Not only do these vacuums last much longer but they also do a better job at removing dirt from your floors. Pet dander is another big trigger of allergic reactions. If you have one or more pets in your home try to keep them off your furniture, bedding, and clothing to reduce your exposure as much as possible. There is allergen resistant bed coverings that are designed to cut down on dander that makes its’ way in, but really the best way is to just keep the bedroom doors closed while the animals are inside. And in addition, any fabrics that do come into contact with your pets should be vacuumed or washed often. You don’t want to let dander build up over time as this will greatly increase your chances of getting it on your skin or inside your body. Pollen is responsible for many seasonal allergies but what most people don’t realize is you can get exposed inside your home. Like other allergens, pollen can easily travel in the air from one place to another. If your windows or doors are open and there is a slight breeze pollen particles can quickly come right in. It is recommended to pay attention to current pollen counts and when they are high to keep your windows closed. Use the air conditioning instead but make sure you clean or replace your filter at the start of each season. Mold spores are not usually thought of as allergens but they are another tiny particle that can cause reactions. To reduce your exposure you should clean and disinfect any rooms that can have moisture like bathrooms, kitchens, and even basements on a regular basis. Make sure there is no standing water and try to use exhaust fans when cooking to keep humidity down. Also, a dehumidifier is very important in the basement during the warm summer months to reduce the humidity in the air that makes its’ way inside. Mold grows where it is warm and damp, so as long as you keep the moisture down there will be almost no chance for it to thrive in your home.